Moneta Musings: Each generation will reap what the former generation has sown. In what I consider to be a brilliant move China has loosened capital controls allowing their companies to keep earnings without repatriating them. “The direction is clear. The authorities want less foreign exchange to come in, so they are giving exporters the right to keep it abroad,” said UBS China economist Wang Tao. The implications of such a move appear to be over looked by many if not all those in the financial media. The Chinese essentially are taking the old nursery school taunt and updating it into a monetary response. The taunt goes something like I’m rubber your glue whatever you say bounces off me and sticks to you. Dear reader you see that by allowing their businesses to keep capital outside of China they in essence have created a “rubber” economy there by Chinese business can compete abroad and keep the inflation off shore. This also allows Chinese companies to acquire either market share or other resources in dollars. If the Chinese had not implemented this measure then as the world economy picks up or at least some demand grows the sales of the various companies would have to be repatriated meaning exchanged for Yuan having the double effect of importing inflation and increasing the trade deficit. In the meantime the Chinese who have a history of government overthrow for poor conditions do not want the continued inflation particularly in agriculture products. The Chinese are keenly aware that just as an army moves on its stomach a populous is much more willing to overturn a government because of empty bellies. The reason the Chinese have tried to quell the inflation situation in their country by raising bank reserve ratios instead of interest rates is they don’t want to exacerbate the inflation problem by having yield hungry investors round the world decide to park money in the country. The yield hounds around the globe would only serve to boost internal inflation by expanding the money supply through the banking system. 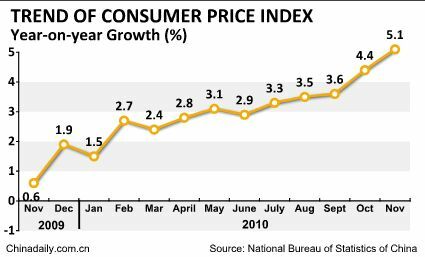 Of course the Chinese actions are only creative countermeasures to “B52 Ben’s” inflationary policies. I know Benny has been on the talkies flatly denying that the FED is printing money, but dear reader, by now even the dimmest amongst us recognizes that he is not being truthful and hiding behind economic obfuscation. It appears to me that “B52 Ben” has decided that the Chinese must revalue their currency and he has decided that the best way to force their hand is to print enough dollars to break the Yuan Dollar peg. Obviously the Chinese do not consider breaking of the peg to be advantageous as of yet so this is the reason that they are instituting the counter measures to contain Benny’s inflation. It is a bit of cat and mouse ort the 21st century equivalent of the great game. With much of the talk here in the states and Euroland focused around the fact that inflation is low no one seems to consider that it could shift back here. The proposal by China to allow the dollars earned outside the country to be kept and invested there will more than likely begin to drive global inflation albeit at a slow pace initially. The more dollars Chinese companies collect and then redistribute back in the form of purchases will only lead to an expansion of money in the West. If we do get inflation in the West and the Yuan remains pegged to the dollar then it will only serve to magnify the inflation in China. The Chinese are very smart and recognize the fact that with the peg what is bad for the Dollar is also bad for the Yuan. I believe that actions the Chinese are taking are a precursor to allowing the Yuan to float freely. A free Yuan would immediately allow the Chinese to control inflation as the currency would appreciate and cut the costs of most everything from food to steel. There are those that argue that the Chinese are still dependent on the US because of their exports, but it is only a matter of time before they have enough of an internal market where their demand out paces foreign demand for exports. I liken China’s situation to that of the US in the early part of the 20th century when markets were developing and internal demand was growing. 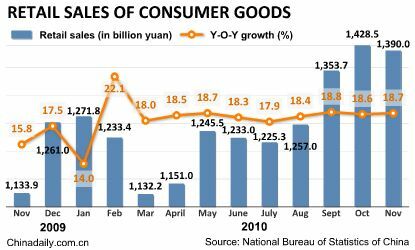 Chinese internal demand figures based upon retail sales have increased over 18% year over year in October and November. Further indications that China’s internal markets are reaching a point of critical mass include the fact that their domestic auto market is now larger than the US market and projected to keep growing even with the removal of some government programs that temporarily distorted demand. In 2011 Noumura and Booz Allen are still projecting vehicle sales of around 20 million well out pacing the United States. 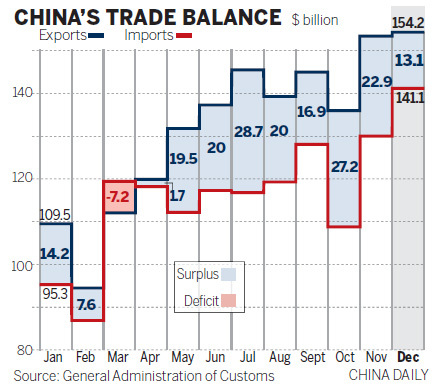 Furthermore, the rising domestic demand has somewhat tempered the “trade deficit” and has shifted the rhetoric away from the Yuan “boogey man” at least for now. In the mean time China is actively seeking to build its gold reserves and encouraging its people to save in real money. It is not nearly the cultural stretch for the Chinese to save in hard assets as the Asian markets have a historical and cultural bias towards doing so. In fact I would contend that the buyers in Asia and India acquiring metal are hampering the shorts efforts at all out raids in the metals. The increasing step up in Eastern buying has put a floor under the metals and while there can be bear raids they are increasingly ineffective. Even mainstream media sources like Bloomberg are beginning to carry articles like “Gold Must Exceed $2,000 to Be Considered in a Bubble, Deutsche Bank Says”. I believe that these types of articles will become more commonplace as we move forward in the gold bull since there will be a growing recognition regarding the debasement of global currencies. The Chinese were also early adapters regarding gold and it is for the aforementioned reason that they look to acquire more reserves. The Chinese culture is geared to contemplate and implement plans that can span out over years and it is obvious that they have decided to provide some form of gold backing to their currency. In the latest round toady China announced its latest moves in order to bring the Yuan to center stage and begin to unseat the dollar, by allowing US citizens to begin to trade it. This is a first step in allowing exchange rates and making the currency more flexible. A flexible currency is what is needed to be taken seriously as an alternative to the dollar at some future point, but you have to begin somewhere. As far as I can see the dollar Yuan battle is far from over but we have two sides with different plans. It is argued in the media that the Chinese and the West have a common interest but I don’t completely subscribe to that philosophy. I believe that the Chinese will share our “common” interest as long as it benefits them and not one second more. I am not calling for war with China although that cannot be ruled out but instead there will come a point where China feels that it is no longer getting anything from the relationship and then decisions will be made in China’s interests only. There are those that compare the symbiotic relationship we have with China to that of MAD (mutually assured destruction) that was in place with the Soviets. People hail and use MAD as an example all the time but the fact that the policy worked was more a function of luck and our stature rather than the psychological aspect of the strategy. You see dear reader people have a tendency especially in the US to think ethnocentrically, which is a mistake. The concept behind MAD was that if we and the Soviets pointed missiles at each other that it would prevent a war since we value life. Soviets based their strategy heavily on deterrence of a U.S. ﬁrst strike. Deterrence for the Soviets was based on their ability to inﬂict signiﬁcant damage to the aggressor (IE. the US) by preemptive, “retaliatory-meeting,” or purely retaliatory strikes against both military and civilian targets. Depending on the reaction timing of the Soviet Command And Control or Leadership determined the response to a threat. The Soviet response to MAD was crafted because of the influences from the German invasion during WWII shaping their perception versus the US who had not had the same experiences and therefore different perception. The concept of MAD ended because President Reagan basically outspent the Soviets and caused their economy to implode in an effort to try and match our defense spending. MAD worked but not for the popular notions and ironically it ended because of the deficit spending that is killing us today. So the symbiotic trade relationship between the US and China is viewed by each side through different lenses. The relationship has worked thus far because it has been in the interests of both parties, but we are rapidly approaching an inflection point where the needs of China will differ from the wants of the US. As we get closer to that fateful day China continues to build the means to have a strong and vibrant economy while Benny and the boys just keep papering over the problems. Congress is no help in this area and won’t be until there is a crisis at which point it most likely be late in the game and even more painful than dealing with the problems at present. Even States and municipalities are sensing there are problems coming down the pike with the dollar and are taking steps to try and create alternatives so the systems don’t break down when things come to a head. Here in Massachusetts in the Berkshires the communities have come up with their own local currency called “Berkshares”. Yesterday, I came across a proposal by the State of Virgina’s house Sub committie who was trying to subpoena FED documents in order to make informed decisions regarding an alternate currency to the dollar. You can read the Virginia House Resolution number 557 in PDF form here. History may look back at all these events and it will be abundantly clear that the dollar was falling apart and China made the right moves to capitalize on the situation. Please don’t misunderstand dear reader, this is not an overnight process but just as the 2nd half of the 20th century was the beginning of the American century the 2nd half of the 21st century may well belong to China. It will not be a straight line but China sure has the potential and as far as I can see we as a country are wasting ours. As the title of this missive an old Chinese proverb says, ”Each generation will reap what the former generation has sown”; unfortunately we don’t appear to be sowing as well as the Chinese. We are to worried about Political Correctness, democrats blaming Republicans and vice versa, what’s on TV, who won Idol, the latest star rumors about Tiger Woods or Lindsay Lohan rather than discussing calmly and rationally the problems and implementing solutions. Until we can learn as a country to compromise things will keep getting messier and messier, I pray we can. If you want to play the Yuan you can buy Market Vectors Chinese Renminbi/USD ETN (NYSE : CNY) to capitalize on a rising Yuan. In the meantime the Chinese, most of Asia and India are buying gold\silver\platinum and you should too. If the Chinese do manage to revalue the Yuan it may initially cause a decline in gold , silver and commodities but it will be temporary and those items will come roaring back with a vengeance and continue far higher. F*ckin' tremendous things here. I am very glad to see your post. Thanks a lot and i am looking forward to contact you. Will you please drop me a mail? With China's economy emerging, and seemingly self-sufficient and is devoid of any economic anchors overseas, it's only advisable to take Yuan as a major player in forex trading when it becomes fully in trade. Lions, Tigers and Gold Bears ...OH My! Where Precious Metals Investors Fear to Tread….